Responsive design is something we’ve mentioned a few times here on the GBW Blog. Last year, we made the GBW website responsive. The goal was to create a site that provides the best possible experience for those visiting the site on a smartphone or mobile device. Responsive design requires a little more coding and design when you’re first creating the website, but it’s very worthwhile in the long run. Many design companies actually start with the smartphone design first these days instead of the desktop version of the site. You’ll still have people using your regular website in the future, but you’ll see more visits from smartphones. The best answer to the trend is responsive design. So if you’re new to the concept we have a few examples here from agencies with great responsive websites. Check these out on your phone or simply make your browsing winder smaller. The first one on our list is Pinch / Zoom. I’m sure they would like to have their name formatted correctly, but this way looks the best on text so we’re going with it. This responsive website seems a little different. There appears to be more going on than normal. Maybe there is some sideways swiping going on there at the top. I also like the image. Images on websites are difficult. You don’t want something that is completely different than what you’re trying to communicate. Then it can just become distracting, but in this case I think it works. Looking at this site you almost get the sense that it was designed with the mobile-first mentality. I like the simple design. You don’t have to have a lot going on for your website to be effective. Focus on your sales process. Provide the content you need to make a sale and the design kind of puts itself together from there. I think this site does that well. This site is really cool. Flov seems to focus on the work they done. It’s a great way to show what you can do without being boastful about things. You can showcase your work right on the homepage especially with a responsive design. That’s exactly what Flov does on their site and it’s recognized as a great agency responsive design. 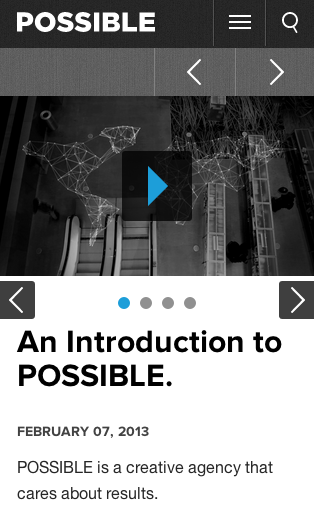 Possible is a creative agency that cares. You know this immediately when you click on the “Who We Are” section on their homepage. What I like most about this page is the video at the top. Again, you don’t have a lot of space on a smartphone screen to win over your visitors. Video is a great way to use your space to share a lot of content. You can tell a story, share a description and do all kinds of things to get your visitors into the selling process. 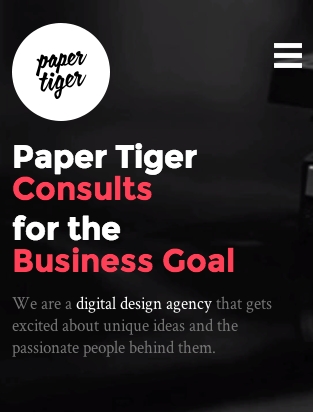 There is obviously a lot going on with the Paper Tiger homepage. You have a spinning record going on in the background, which is kind of cool. They get you to the work portion of their website right away, which is good. You can imagine that part of the sales process for an agency is to showcase the work. 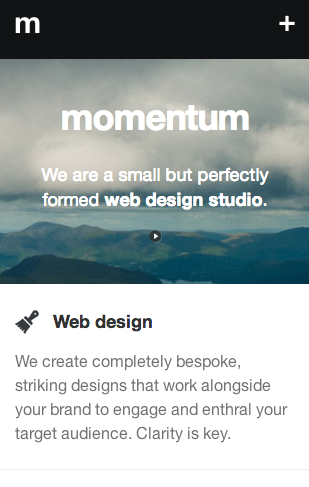 The setup for the work page is perfect for responsive design. It’s easy to see and experience and that’s what you need from responsive design. 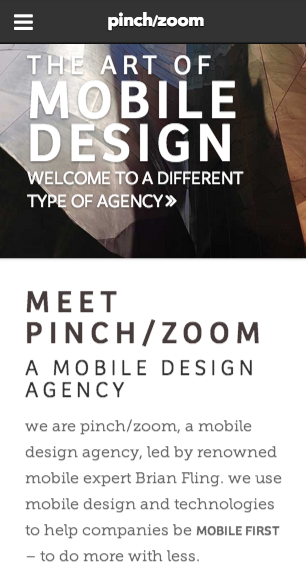 This is a design agency that focuses on responsive design. You might be surprised to hear this, but some companies that say they specialize in something don’t do it for themselves. It would be like a blogging company that doesn’t maintain their own blog *wink*. 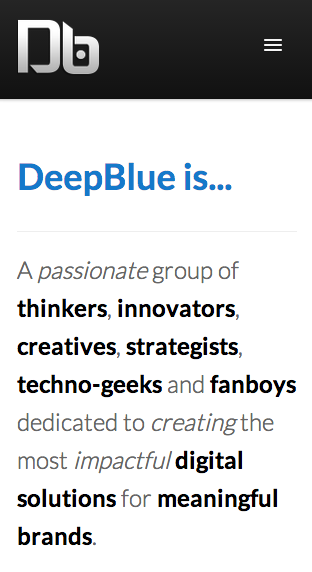 But in the case of DeepBlue they definitely take their own advice. They have a great responsive website that right away on the homepage you get text telling you exactly what the company is about. That’s key on a mobile site. You don’t have a lot of time to win over the visitor’s attention so tell them what you do and how it helps them right away. 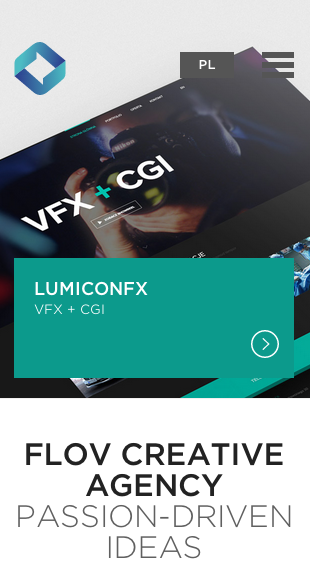 Those are 6 agencies with great responsive websites. More people are using smartphones to access the web every day. It’s time to focus on those people otherwise they’re going to leave your website and visit other sites that offer better mobile experiences.